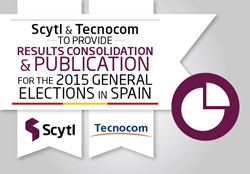 Scytl, the worldwide leader in secure online voting and election modernization, and Tecnocom, one of the top three IT companies in Spain, today announced the award of the contract to supply the technology and support for election results consolidation and publication for the 2015 Spanish General Elections to be held later this year. After the assessment of all the proposals presented, the joint venture formed by Scytl and Tecnocom received the highest points and was therefore awarded the project. The offer submitted is a clear alternative to previous solutions used by the Ministry of the Interior for national elections. The new solution will ensure a secure, transparent and efficient execution of the election, guaranteeing a timely consolidation, processing and publishing of the election results. The solution will enable the publication of results even before the established timeline. In addition the offer presented by the joint venture Scytl-Tecnocom provides efficiency and savings when compared to those from the previous local elections held in May this year. "We have worked in electoral modernization projects in 42 countries and are pleased to put our technology and experience in the electoral arena at the disposal of the Ministry of the Interior," says Pere Valles, CEO at Scytl. "Our solutions in the electoral arena along with our partner Tecnocom's proven experience in strategic technology logistics management will allow us to guarantee a timely delivery of a project key importance." "This is a strategic project for Tecnocom and means provisioning these services in all the markets we currently cover. Tecnocom is a vendor of reference in high value project delivery in the Public Sector in Spain and other countries such as Colombia, Chile and Peru for over 10 years," comments Javier Martin, CEO at Tecnocom. "In this type of projects, where the excellence in execution and timely delivery are critical, is where the quality of professional and company leaders is demonstrated." Scytl and Tecnocom will deliver all logistics services, and personnel, technology, security, communications support and the counseling during the pre-election, election day and post-election phases. All executed in close coordination not only with the Ministry of Interior, but also with all the related institutions such as the Electoral Boards, the Electoral Census Office and Government Delegations and Sub-delegations among others. Tecnocom is one of the top three IT companies in Spain with extensive experience in high-tech operations and high value for the Public Administration, Banking and Insurance, Telco, Media, Industry and Energy sectors.